This is a scalable context timeline. It contains events related to the event December 31, 1995: FBI ‘Profile’ of McVeigh Compares Accused Bomber to Serial Killer. You can narrow or broaden the context of this timeline by adjusting the zoom level. The lower the scale, the more relevant the items on average will be, while the higher the scale, the less relevant the items, on average, will be. First Exposure to African-Americans, Survivalism - McVeigh, a 19-year-old sometimes called by the disparaging nickname “Noodle” who is unable to connect with women on almost any level due to his shyness, works for a firm currently called Burke Armor Inc., which will later rename itself as Armored Services of America, though he has a considerable amount of expertise with computers and conceivably could have landed a job in that field. McVeigh works out of a depot in Cheektowaga, near Buffalo, mostly delivering money to and from banks and stores, quickly earning a reputation as a reliable, hardworking employee. He works for eight months with a partner, Jeff Camp. This job gives him his first opportunity to work closely with African-Americans; the region of upstate New York he resides in is almost devoid of African-Americans, and the area has long supported a large and active Ku Klux Klan chapter. McVeigh learns from some of his fellow employees about inner-city strife and other related racial and economic issues. Later, he will recall making special deliveries at the beginning and end of each month to check-cashing firms; sometimes he would have to wade through long lines of African-American welfare recipients, and on occasion would brandish his gun to get through the lines. He often drives by African-American homes and sees the residents sitting on their porches, one of the reasons he begins calling African-Americans “porch monkeys.” He also begins reading “survivalist” books such as The Turner Diaries (see 1978), The Anarchist’s Cookbook, and The Poor Man’s James Bond. Buys Property for Shooting Range - After getting his first gun permit, McVeigh buys 10 acres of wooded property north of Olean, New York, with a partner, David Darlak, and the two use it as a shooting range. As teenagers, he and Darlak formed their version of a “survivalist group” after watching movies such as The Day After, a television movie about the aftermath of a nuclear strike in Kansas. A neighbor, Robert Morgan, later recalls his father calling the police to complain about the incessant gunfire. “My dad turned him in,” Morgan will recall. “One day it sounded like a war out there. Sometimes he’d come down during the week, sometimes the weekend. He had on hunting clothes. Camouflage.” McVeigh continues his shooting activities even after Darlak loses interest. McVeigh Goes on to Serve in Persian Gulf War - McVeigh will serve two tours of duty in the Persian Gulf War, serving honorably and winning medals for his service (see January - March 1991 and After). Nichols and McVeigh will later be convicted of planning and executing the Oklahoma City bombing (see 8:35 a.m. - 9:02 a.m. April 19, 1995). Withdraws from Special Forces Training - After returning to the US, McVeigh begins 21 days of Special Services training at Camp McCall, west of Fort Bragg, North Carolina (see October 1990). He is thrilled to be joining Special Forces, and is confident that he will pass the grueling physical and psychological assessments. However, he leaves the training at Camp McCall during the second day. He later tells people he withdraws because of a leg injury. 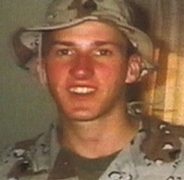 Some military officials will say that preliminary psychological screening shows him to be unfit for Special Forces, leading some reporters to conclude that McVeigh was kicked out of training, but those conclusions are inaccurate: McVeigh’s screenings are not processed until long after he leaves, and his withdrawal is entirely voluntary. McVeigh later says that he begins training with a friend, Specialist Mitchell Whitmire (one source spells his name “Whitmyers,” apparently in error), days after returning from overseas duty. He will say that he is in poor physical condition, mentally and physically exhausted from his time in combat, and unready for the physical demands of Green Beret training. He does not accept an offer extended to him and other combat veterans to take some time off and try again at a later date. Instead, after two arduous days of physical workouts, McVeigh and Whitmire leave the training program before McVeigh’s assessments can be graded and reviewed. On his Statement of Voluntary Withdrawal, McVeigh writes, “I am not physically ready, and the rucksack march hurt more than it should.” Ives will recall McVeigh as being “extremely disappointed.” Thigpen later recalls: “Everybody knew he was highly upset. We never knew the reason why he didn’t make it. We figured, you don’t make it, you don’t make it. But he was definitely angry. He was upset, very upset.” Fellow soldier James Fox later tells a reporter that McVeigh’s withdrawal from Special Forces training was a defining moment for him, saying, “Whether he withdrew or was kicked out, it still was a failure and very easily he could externalize blame.” McVeigh then takes a 30-day leave to visit his sister Jennifer in Florida, and to spend some time in upstate New York, where he grew up (see 1987-1988). [New York Times, 4/23/1995; New York Times, 5/4/1995; New York Times, 7/5/1995; Stickney, 1996, pp. 115-119; PBS Frontline, 1/22/1996; Serrano, 1998, pp. 41-42] Author Brandon M. Stickney later writes, “It was revealed in confidence to [me] that answers McVeigh gave on the psychological tests were apparently a bit off-center, not the answers of a man capable of long-term assignments with the exclusive and tight Special Forces.” Stickney will also write that McVeigh may be suffering from “Gulf War Syndrome,” a mysterious series of maladies apparently caused by exposure to toxic chemicals. [Stickney, 1996, pp. 117-118] In 1993, McVeigh will write a letter to his sister Jennifer giving a very different explanation of his reason for withdrawing from Special Forces tryouts (see October 20, 1993). After he returns from active duty, he begins displaying increasingly eccentric behavior (see March 1991 and After). McVeigh will go on to bomb a federal building in Oklahoma City (see 8:35 a.m. - 9:02 a.m. April 19, 1995). Authorities indict Steven Garrett Colbern on federal weapons charges in Oatman, a small mining town in northwestern Arizona. They describe Colbern as a “drifter” who is wanted on weapons charges in California. 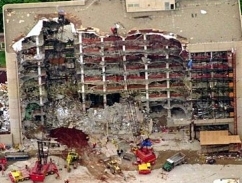 Colbern becomes of far more interest to federal authorities when he tells them he knew accused Oklahoma City bomber Timothy McVeigh (see 8:35 a.m. - 9:02 a.m. April 19, 1995 and April 21, 1995). However, authorities say they have no reason to believe Colbern was part of the bomb plot. Colbern attempted to fight off the law enforcement officials who arrested him, even attempting to pull a pistol during the brief melee, and is charged with resisting arrest as well. Investigators search his Oatman trailer and find firearms, ammunition, stolen medical supplies, and a laboratory for making methamphetamine, but no evidence linking Colbern to the bombing. Colbern tells investigators that he knew McVeigh under his alias, “Tim Tuttle” (see October 12, 1993 - January 1994 and February - July 1994), but says he knows nothing about the April 19 bombing. US Attorney Janet Napolitano says she does not want Colbern released on bail just yet. Oatman residents say Colbern came to town about four months ago, and has supported himself as a dishwasher and cook’s helper at a local restaurant. He has a degree in chemistry from UCLA and was a former research associate in DNA studies at Cedars-Sinai Research Institute in Los Angeles. Acquaintances who knew him during his youth in Oxnard, California, say he always had an interest in science and explosives. Dale Reese, who knew Colbern in a school biology club, says of Colbern: “He did talk about explosives. He was just interested in those sorts of things. He just liked making things go boom. He was very strange, very smart, kind of nerdish, kind of lonerish. I didn’t like the guy.” Authorities found a letter in McVeigh’s possession addressed to someone with the initials “S.C.,” and further investigation connected the letter with Colbern. Oatman is only 20 miles southwest of Kingman, Arizona, where McVeigh has frequently lived (see November 1991 - Summer 1992, May-September 1993, February - July 1994, September 13, 1994 and After, October 4 - Late October, 1994, February 1995, February 17, 1995 and After, and March 31 - April 12, 1995). Restaurant owner Daryl Warren tells a reporter that he has heard Colbern express anti-government and pro-Nazi sympathies in the past, and has spoken of the Arizona Patriots, a right-wing paramilitary group (see April 22, 1995). Warren says: “I do recall on two or three occasions politics being brought up, and he would always make references to the Third Reich. I was convinced that he was not too happy with our government.” Warren also says that Colbern was out of town for two or three weeks at the time of the bombing; Lou Mauro, who employs Colbern, says Colbern told him he was going to Los Angeles to visit his ailing mother and did not return until the weekend of April 22. One of Colbern’s roommates, Preston Scott Haney, says he and Colbern were together at the time of the bombing. “They [the FBI] think he is part of the Oklahoma bombing, but he was sitting right next to me when the bomb went off,” Haney says. “And he was here the week before and the week after.” Officials in Washington say they do not believe Colbern is “John Doe No. 2,” the missing man suspected of either being part of the bombing plot or a material witness to the conspiracy (see April 20, 1995). Another of Colbern’s roommates, Dennis Malzac, is also arrested on arson charges, and is suspected of being connected to an explosion behind a house in Kingman last February (see February 1995), along with a second man suspected of being in Connecticut. [New York Times, 5/13/1995] Newsweek will describe Colbern as a “gun-toting fugitive.” [Stickney, 1996, pp. 193] Days later, federal officials will clear Colbern of any involvement in the bombing. They will say that they hope Colbern can shed some light on McVeigh’s activities in the months before the bombing, and may offer him leniency on the charges he faces if he becomes a witness for the government prosecution of McVeigh. Both Colbern and McVeigh frequented gun shows in the northern Arizona area, but no witnesses have come forward to say they ever saw them together. [New York Times, 5/16/1995] Authorities believe McVeigh may have tried to recruit Colbern for his bomb plot (see November 30, 1994). A New York Times analysis of indicted Oklahoma City bomber Timothy McVeigh (see 8:35 a.m. - 9:02 a.m. April 19, 1995, July 11-13, 1995, and August 10, 1995) uses an interview with FBI profiler Jack Douglas to paint a picture of McVeigh as a burgeoning serial killer. Douglas, the model for the FBI analyst in the movie The Silence of the Lambs, describes McVeigh as an underachieving loner whose stunted social development, obsessive neatness, inability to deal with his abandonment by his mother, sexual frustration, obsession with guns, and overarching alienation led him to conceive and execute a plot that killed scores of innocent people. “There are the same kind of characteristics” in McVeigh’s makeup as serial killers possess, Douglas says. “Asocial, asexual, a loner, withdrawn, from a family with problems, strong feelings of inadequacy from early in life, an underachiever.” McVeigh did well in the highly structured environment of the US Army (see March 24, 1988 - Late 1990 and January - March 1991 and After), Douglas notes, but was unable to function successfully outside of that environment (see November 1991 - Summer 1992). His lifelong obsession with guns (see 1987-1988) blended with his increasing fascination with far-right militia, white supremacist, and separatist ideologies that led him to believe the government was actively plotting to disarm and repress its citizenry. McVeigh, always fascinated with computers, used the burgeoning network of computerized bulletin boards, email clients, videotape exchanges, shortwave radio broadcasts, and other information resources to fuel his beliefs, all codified in what Times reporter John Kifner calls “a venomous novel called The Turner Diaries” (see 1978) that depicts rebel white supremacists overthrowing the federal government and committing genocide against minority citizens. 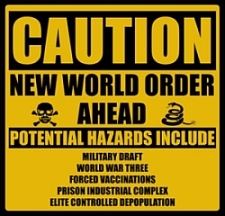 Apocalyptic World View Triggered by Events - McVeigh’s increasingly apocalyptic world view, Douglas says, led him to carry out the bomb plot, perhaps in an effort to bring about the same supremacist rebellion that The Turner Diaries depicts. 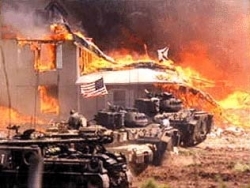 The federal raids on Randy Weaver’s cabin in Ruby Ridge, Idaho (see August 31, 1992), and the Branch Davidian compound in Texas (see April 19, 1993), the passage of the Brady gun control bill (see November 30, 1993), and the birth of the paramilitary militia movement (see August 1994 - March 1995) all spurred McVeigh forward. Kifner writes: “The paramilitary movement vowed to resist the government and publish manuals on forming underground guerrilla squads. Mr. McVeigh was just a little ahead of the curve.” The final straw for McVeigh, Kifner and Douglas theorize, was the passage of the August 1994 crime bill that outlawed 19 types of semiautomatic assault weapons (see September 13, 1994). Shortly thereafter, McVeigh wrote an angry letter to his friend Michael Fortier alerting him that he intended to take some sort of “positive action” against the government (see September 13, 1994). 'Red Dawn' and the Militia Movement - McVeigh’s favorite movie is, by all accounts, a 1984 film called Red Dawn that depicts a group of Texas high school football players banding together to defeat an invasion of Soviet paratroopers. The “Wolverines,” as the footballers term themselves, transform themselves into a polished, lethal guerrilla force. The film contains a number of tropes that resonate with McVeigh and other militia sympathizers: the use of gun-registration forms to enable the Soviet invasion, political leaders eager to betray the American citizenry they represent, and others. The film is a cult classic among militia members. Along with another extraordinarily popular series of movies, the Rambo films, Red Dawn expresses what sociologist James William Gibson has noted is a new perspective on military veterans and popular culture; whereas traditional war movies show raw recruits uniting to battle an evil enemy on behalf of a just national cause, post-Vietnam movies such as Red Dawn and the Rambo films popularize the archetype of an alienated loner or small band of outlaws, betrayed by their own government and fighting for their view of the American ideal as renegades. Another favorite film of McVeigh’s is a very different offering, the 1985 black comedy Brazil, which depicts an Orwellian future dominated by an all-powerful bureaucracy. Actor Robert DeNiro plays a commando-like “outlaw repairman”; his character’s name is “Tuttle,” one of the aliases used by McVeigh (see April 19, 1993 and After, October 12, 1993 - January 1994, December 1993, February - July 1994, and May 12, 1995). The last movie McVeigh rented before the Oklahoma City bombing was Blown Away, the tale of a mad bomber.